DAM: CH ONE*OAK*HILL TWEED JRUPENT 6th place 2 y.o. 2002 ADGA National, 1st place 3 year old & NATIONAL BEST UDDER 2003 ADGA National!!! We are very excited to have the opportunity to add Rufio to our herd. His dam Rupent finished her championship as a 2 year old & then, when we got the news of her success at the 2003 ADGA National Show we were thrilled beyond belief! Rupent is a truly spectacular doe who appraised 92 EEEE for 2003. 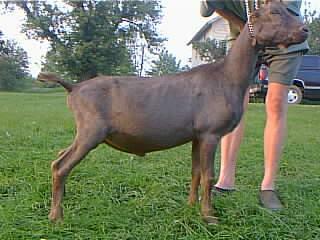 She has a full brother, JRupaul who is retained in the One*Oak*Hill herd, who was littermate brother to the 1999 Colorama Sale doe who sold for over $2000. "Rudy" has sired at least 2 GCH daughters & has several more with CH legs. Rufio's sire Talon's littermate sister, Toluca was 4th place 4 y.o. at the 2002 ADGA National Show. Talon has at least 2 CH daughters & several more w/ legs toward their championships, too.